Before you go wedding dress shopping there are some tips you need to know to have a hassle free experience. You need to establish a budget and be resolved to stick to it. This is especially true if you have a limited budget for your wedding. You also need to establish a budget for your wedding dress accessories. This will help you not to "overspend" when you go shopping at bridal shops. How so? Let's start with what happens on your arrival. 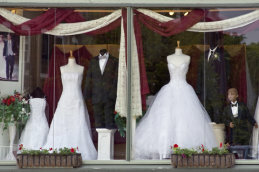 Be up front about your wedding dress budget when you arrive at the bridal shop. When you arrive at the bridal shop you will be asked to fill out a registration card. At some shops they will ask which wedding gown styles you are interested in and proceed to pull some dresses for you to try on. Is this a good thing? Not if you are a bride on a budget! Likely you will be shown their higher price dresses and asked to try them on. You will most likely fall in love with one of these dresses. When you ask about the price you will likely find the gown is over your budget. You now begin to try on dresses within your price range. Soon you realize that you are having a hard time finding something that measures up to the higher priced dress. So now do you continue wedding dress shopping or do you decide to buy the high priced gown and cut your wedding budget somewhere else? "I had a bridal alterations customer who told me she felt so intimidated by a bridal shop sales person that she ended up spending $400.00 on a bridal veil even though she was on a limited budget." "She had tried on dresses and veils in a bridal shop without asking the price. She found a dress and veil she liked. But she nearly fainted when she heard the price of the dress." She felt so embarrassed that she couldn't afford to purchase the gown, she reluctantly purchased the veil. She told me that the veil purchase caused her to go over budget, so she decided to compensate by spending less than she planned on her wedding gown." "The last thing you want to do is make a buying mistake that makes it necessary for you to spend less than you planned to for your dress." Before you try on anything... always, always let them know your budget. Fortunately more consultants are starting to be more customer service oriented and will ask brides about their budget right away. But if your consultant should neglect to ask you... you will need to speak up. If you want to build some flexibility in your budget . . . it is helpful to mention to your bridal sales consultant a price range a little lower than the highest you would go. This way if you don’t see something you like in that price range. You can choose to move up and still be within your budget. "Some bridal consultants believe you should go to an expensive bridal salon to shop for dresses even though they may not be in your budget. Why?" "They feel that you will get an idea of what a good quality wedding dress is like and you can now use this information to evaluate the quality of bridal gowns as do your wedding dress shopping." "I feel you will set yourself up for disappointment if you do that. The quality of higher priced gowns usually is much better than lower priced gowns. Once you see yourself in a higher quality gown it is very hard to like anything else. You see brides go through this dilemma all the time on the "Say Yes To The Dress" tv show. So if you are a bride on a budget remember before wedding dress shopping set a budget for your wedding dress cost, be proactive. This will give you the control needed to stay within your budget while shopping for your perfect wedding dress.